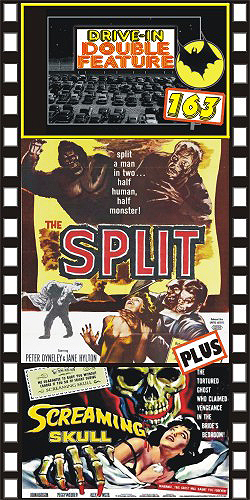 THE MANSTER (1959) Peter Dyneley, Tetsu Nakamura, Jane Hylton, Terri Zimmern. This was first released on DI Combo #2 many years ago along with Horror Chamber of Dr. Faustus. Sadly, we lost Dr. Faustus to the GATT copyright restoration. But we always felt The Manster should have another DI partner, so here it is, the chilling tale of a reporter injected with a strange serum by a mad scientist. He finds himself transforming into a horrible, two-headed monster. The "eye coming out of his shoulder" scene is a classic. One of our all-time favorites. Beautiful print. 35mm. PLUS: THE SCREAMING SKULL (1958) John Hudson, Peggy Webber, Alex Nichol. We couldn't believe it when we discovered this great DI chiller had never been part of one of our DI Combos. It's another great AIP horror film about a woman who is terrorized by the vision of her husband's first wife's skull. A well-paced chiller that boasts a fine music score. Webber is gorgeous. Be ready for the shocking, supernatural ending. From 16mm.